Growing up on a small farm in Missouri I always had a passion for tractors. My career included eleven years managing and selling for a dealership and ten years before that working for a farm equipment company. So, I know a little about tractors. I've always felt empathy for the poor guy (or, more often than not, gal) who’s looking for their first tractor and doesn’t understand the first thing about the lingo or what they need to do their various jobs. It hit me one day, I wonder if there’s any place on the Internet to go for farm tractor training with how-to videos? All I could find might give you the “how-to”, but it also told you which brand you needed to buy and was obviously a plant by a manufacturer or retailer. So I began the Tractor Mike training program. 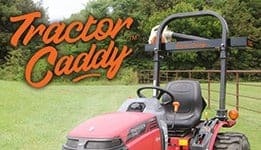 My sole goal here is to help you understand the tractor lingo, choose a product that will do the jobs you need done, and know how to operate it safely. I’m here to pass on the basics of equipment; the stuff that dad taught me growing up, and the wealth of knowledge that I learned in a dealership, taking care of customers. In addition to providing this service, I teach Agricultural Sales at Missouri State University, co-own EDM, a company that develops dealer websites and offers YouTube consulting, and write articles and columns for farm equipment dealer magazines. And the best thing of all, since I work from my home I get to use my tractor more! Thanks for visiting the website. If you have questions or video ideas just fill out the form below!